Can organisms survive on Mars, and can we identify them? On 22 October 2014, cosmonauts Maxim Suraev (top left in the picture the glove of his space suit is visible) and Aleksandr Samokutyayev removed the protective cover of EXPOSE-R2 (the R stands for the Russian version of the exposure platform, the 2 for the second experiment of this kind on the International Space Station (ISS)). In this experimental setup, BIOMEX was one of four experiments. The other experiments were BOSS, PSS and IBMP. The ISS offered ideal conditions for these experiments. After the covers were removed, the samples were permanently exposed to the harsh conditions of space, with a vacuum, large temperature fluctuations and intense ultraviolet radiation. After the EXPOSE-R2 experiment system with the BIOMEX experiment was covered, retrieved and returned to the space station by cosmonauts Yuri Malenchenko and Sergey Wolkow during a spacewalk on 3 February 2016, the samples returned to Earth on 18 June 2016 with the ISS Expedition 47 (crew: Yuri Malenchenko (Roscosmos), Timothy Kopra (NASA) and Tim Peake (ESA)). The image shows the Soyuz capsule TMA-19M a few moments before it landed in the steppe of Kazakhstan. The BIOMEX samples were then taken to the DLR Institute of Aerospace Medicine in Cologne and from there forwarded to the laboratories of the international science team for evaluation. Prior to the BIOMEX experiment in the 400-kilometre-high orbit, selection tests were carried out in the Mars simulation chamber at the DLR Institute of Planetary Research in Berlin. Finally, preliminary experiments and, parallel to the experiments in space, tests with an identical experimental set-up to that on the ISS were carried out in a space simulation chamber at the DLR Institute of Aerospace Medicine in Cologne. For this purpose, organisms and cell structures were introduced into a 'Martian soil' under a simulated 'Mars atmosphere'. In this way, 'control samples' were created for the experiment and the scientific evaluation. The image shows the samples of Antarctic cyanobacteria on Mars analogue soil in the Berlin laboratory. From 27-29 March 2019, DLR will be presenting the results of BIOMEX at a final scientific conference. During the BIOMEX experiment, which ran from 2014 to 2016, several hundred samples of organisms were exposed to the conditions found in space or on Mars while on board the International Space Station. The results of the experiment have now been evaluated and show that some organisms that exist on Earth can survive even under Martian conditions. DLR is developing sensors with which the metabolic products of microorganisms can be detected during future space missions. Earth is a very special planet. It is the only celestial body in the Solar System on which we know life exists. Could there be life on other planets or moons? Mars is always the first to be mentioned in this context; it has many properties in common with Earth, and in its geological past water also flowed over its surface. Today, however, conditions on Mars are so extreme that it is hard to imagine that organisms like those found on Earth could survive on that cold and arid desert planet. One of the aims of the DLR-coordinated experiment BIOMEX (BIOlogy and Mars EXperiment) on the International Space Station (ISS) was to find out if this is indeed possible. The results are now available. One key result is that, in fact, several terrestrial biological substances and structures are very tough. They survived very challenging environmental conditions during an 18-month stress test in space. The tests involved samples of different organisms such as bacteria, algae, lichens and fungi being exposed to vacuum, intense ultraviolet radiation and extreme temperature variations on the exterior of the ISS for a total of 533 days. Astrobiologist Jean-Pierre Paul de Vera from the DLR Institute of Planetary Research in Berlin-Adlershof, the person responsible for the scientific management of BIOMEX, was impressed. "Some of the organisms and biomolecules showed tremendous resistance to radiation in outer space and actually returned to Earth as 'survivors' from space," he noted. "Among other things, we studied archaea, which are unicellular microorganisms that have existed on Earth for over three-and-a-half billion years, living in salty seawater. Our 'test subjects' are relatives of theirs that have been isolated in the Arctic permafrost. They have survived in space conditions and are also detectable with our instruments. Such single-celled organisms could be candidates for life forms that might be found on Mars." With this result, the main goal of the experiment was achieved; in principle, living things that exist on Earth under extreme environmental conditions – so-called 'extremophiles' – also appear to be able to exist on Mars. "Of course, this does not mean that life actually exists on Mars," de Vera is quick to note. “But the search for life is more than ever the strongest driving force for the next generation of missions to Mars." The existence of at least very simple life forms on Mars – either in the past four-and-a-half billion years of the planet's history or even now – is in principle conceivable for DLR astrobiologist de Vera and his colleagues. However, up until now, no evidence for life on Mars has been found. Orbiting spacecraft and mobile laboratories on the Martian surface have showed that important prerequisites for life still exist today – an atmosphere, elements such as carbon, hydrogen, oxygen, nitrogen, sulphur and phosphorus, and even water, at least in the form of ice. But the Mars researchers' detectors have not yet registered life itself or its metabolic products. 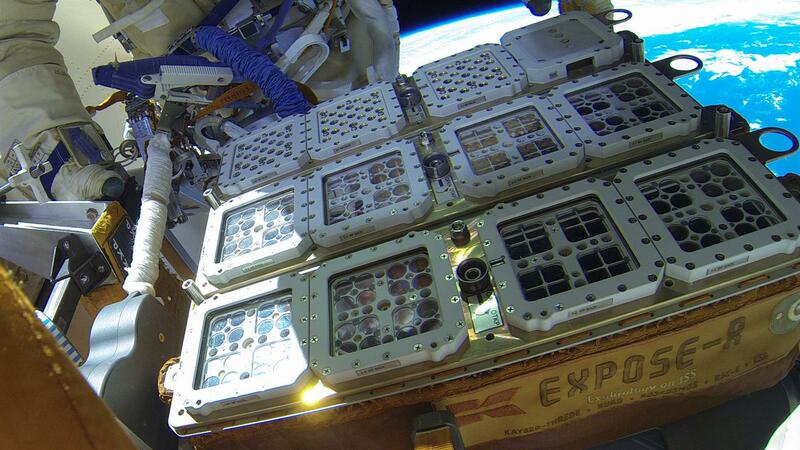 For the BIOMEX experiment, on 18 August 2014, Russian cosmonauts Alexander Skvortsov and Oleg Artemyev placed several hundred samples in an experiment container on the exterior of the 'Zvezda' Russian ISS module. The containers, open to the surrounding space environment, held primitive terrestrial organisms such as mosses, lichens, fungi, bacteria, archaea ('primeval bacteria') and algae, as well as cell membranes and pigments. 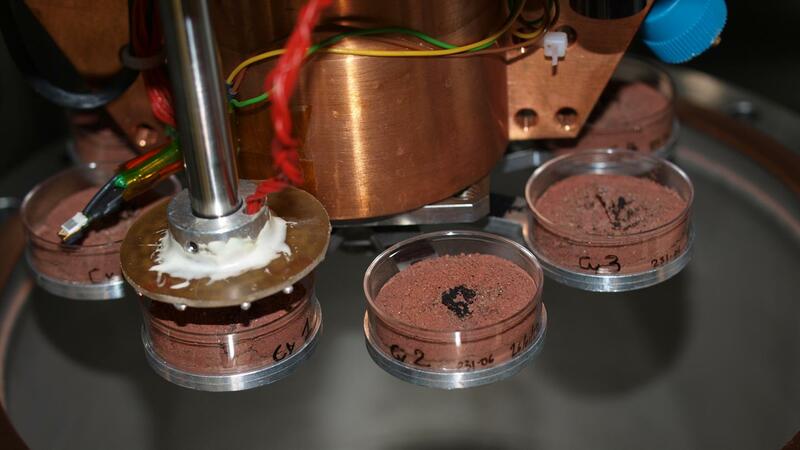 Some were embedded in, among other things, simulated Martian soils with an artificial Mars atmosphere. On 22 October 2014, cosmonauts Maxim Suraev and Aleksandr Samokutyayev removed the protective cover. From then on, the samples were permanently exposed to the harsh conditions of space – a vacuum with large temperature variations and intense ultraviolet radiation. "Once again, the ISS provided ideal conditions for an experiment that could only be carried out under space conditions," de Vera explained. On 22 October 2014, cosmonauts Maxim Suraev and Aleksandr Samokutyayev removed the protective cover during a spacewalk on the International Space Station (ISS) as part of ISS Expedition 41. On 3 February 2016, the cover was put back on the container by cosmonauts Yuri Malenchenko and Sergei Volkov during a third spacewalk, and the samples were brought back into the space station. 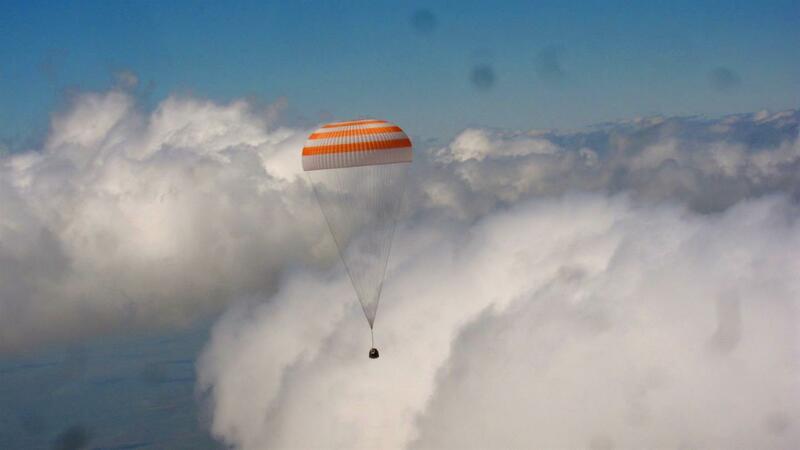 On 18 June 2016, they were returned to Earth with ESA astronaut Tim Peake on board a Soyuz spacecraft. Subsequently, the experiment was transferred from Baikonur (Kazakhstan) to the DLR site in Cologne, and BIOMEX scientists at 30 research institutions in 12 countries across three continents examined the individual samples. From 27-29 March 2019, DLR in Berlin will be presenting the BIOMEX final report with all the results at a scientific conference. To date, 42 peer-reviewed articles have been published in specialist journals. The renowned journal Astrobiology dedicated a special issue to BIOMEX in February (Vol. 19, Issue 2, 2019). The instruments on future missions to the Martian surface could measure the metabolic products or cell constituents produced by microorganisms such as archaea. This represents the achievement of another goal of the BIOMEX experiment. The Berlin-based DLR Institute of Optical Sensor Systems, in collaboration with the Institute of Planetary Research, uses detection methods that require no sample preparation to identify the above-mentioned materials. One of these methods is Raman spectroscopy. "With Raman spectroscopy, we can examine samples on the Martian surface from a rover both non-destructively and without having to make contact with them," explains Ute Böttger from the DLR Institute of Optical Sensor Systems. "Laser beams (high-energy, concentrated light) cause molecules to vibrate. Different molecules have different vibrational patterns that can be used as a distinctive fingerprint to identify molecules and crystal structures." The results of BIOMEX are not only a step forward in the search for life on Mars. They also serve to define 'biosignatures' in space and expand the foundations of a database to serve as the basis for the search for life in the Solar System. Future missions, such as the ExoMars mission planned by the European Space Agency (ESA) for 2020, will benefit significantly from these data. They will be an important aid in the identification and classification of signals observed by ExoMars 2020, or those obtained by spacecraft from other celestial bodies. For example, traces of methane have been detected in the icy fountains of Saturn's moon Enceladus. Here, as well as under the icy crusts of Jupiter's moons Europa and Ganymede, there are likely to be considerable amounts of water in which primitive, single-celled organisms may have originated. BIOMEX was one of four experiments of EXPOSE-R2 (the R stands for the Russian version of the exposure platform, the 2 for the second experiment of its kind). The others were the BOSS, PSS and IBMP experiments. BIOMEX was carried out jointly by ESA and the Russian space agency Roscosmos. "The ISS offered ideal conditions for an experiment that was to be carried out under space conditions," de Vera noted. In parallel to the BIOMEX experiment in its 400-kilometre high orbit, selected experiments were carried out, using identical experimental setups to those in space, in the Mars simulation chamber at the DLR Institute of Planetary Research and in a space simulation chamber at the DLR Institute of Aerospace Medicine in Cologne. Thus, 'control samples' were created for the experiment and its scientific evaluation. BIOMEX – the ESA/Roscosmos 'Biology and Mars Experiment' – took place on the ISS from 2014-2016. The experiment was coordinated and directed by the DLR Institute of Planetary Research. The DLR Institutes of Aerospace Medicine and Optical Sensor Systems were also involved. In Germany, the Robert Koch Institute, the Technical University and the Museum of Natural History in Berlin, the University of Applied Sciences in Wildau, the Fraunhofer Institute for Cell Therapy and Immunology, the GFZ German Research Centre for Geosciences in Potsdam and the Heinrich-Heine University of Düsseldorf were also involved in implementation and assessment.